Installing panic hardware is a great way to ensure the safety and security of your business. These are dangerous times. Businesses are constantly under threat from criminals. Houston, TX and the surrounding areas aren’t immune. Fortunately, at 713 Locksmith Houston, we can help. We’ve been installing, repairing, and replacing exit devices in malls, supermarkets, government buildings, offices, and many other types of commercial establishments for years. We can give your business the benefit of our experience. We are known throughout Houston, TX and surrounding areas for our excellent service. Our success is based on our expert technicians, fast and friendly service, and our experience providing complete locksmith service. Our ability to provide a consistent speedy response to all customers has also endeared us to them. 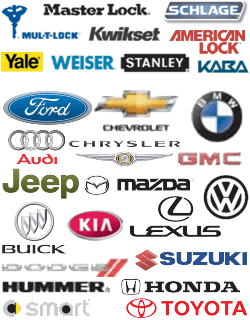 We have a team of mobile locksmiths that are all licensed, bonded, and insured. Plus, every member of our commercial locksmith team has at least 5+ years experience installing, repairing, and replacing panic hardware and a wide variety of locks and other types of security systems for commercial properties. Panic hardware, also known as push bars or crash bars provide additional security for any business and also enable employees to quickly exit the premises in case of emergency. Many crash bar systems come with alarms to make people aware that the security door has been opened. We can install and repair these very effective security and safety systems for your business at a very affordable price. Plus, we will make sure that they meet or exceed all safety laws and codes. We install and repair a wide array of panic devices including vertical and horizontal crash bars with attached sirens to make employees inside aware when the emergency exit doors are opened. These systems even come with battery-powered exit door alarms that continue to function even if there is a power outage. Having panic devices with a control lock alarm can also prevent thieves and other intruders from surreptitiously entering or exiting your business without you or your employees knowing. 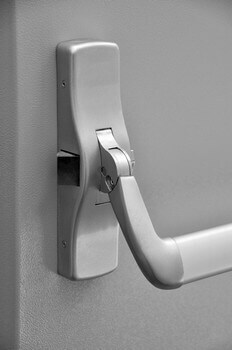 We have experience installing all styles and major brands of this type of panic hardware. 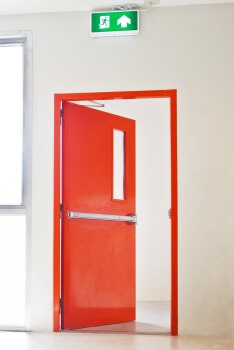 Crash bars are easy-to-use push bars installed on outside opening exit doors to allow for quick unrestricted exiting of buildings. We have installed and serviced these in many different types of buildings including restaurants, department stores, bars, schools, city buildings, and malls. They are very effective and our expert technicians can install them quickly and easily in businesses in and around Houston and the surrounding communities. They are rugged, tamper-resistant, reliable, and come with audible and visual indicators. We can help you select one to suit your business size, occupancy level, and your budget. At 713 Locksmith Houston, we have earned a reputation for excellence as a commercial locksmith because of our highly skilled, well-trained technicians. Each of them has 5+ years experience installing and repairing the latest and best locking and security systems. Plus, they are all licensed, bonded, and insured. They are revered for their fast and friendly complete locksmith service. For the convenience of our customers, our technicians provide up front pricing and locksmith service around the clock. They are locals from Houston, TX and surrounding areas. This enables us to provide a speedy response to every call. Our technicians are locksmiths with an intimate knowledge of Houston, TX and surrounding neighborhoods. This guarantees that they will get to you fast. Their fully stocked vans have all the high-tech tools and equipment to provide your business with complete commercial locksmith service. Plus, our 24x7 locksmith service ensures that any time you have a problem with your locks or security systems, we have well-trained mobile locksmiths with 5+ years experience ready to make your business safe and secure. We are 713 Locksmith Houston and our courteous, professional staff will be glad to address all of your security questions and concerns, and provide you with upfront pricing, fast and friendly service, and uncompromising security and safety by installing, servicing, and replacing your company’s panic hardware and locking systems at a price that can easily fit into your budget. Panic Hardware Installed and Repaired http://713locksmith.com/panic-hardware/ 3.3/5 based upon 13 reviews.